The Metropolitan Opera commissioned and premiered an ambitious new opera, An American Tragedy, by composer Tobias Picker with a libretto by Gene Scheer. The two act opera is based on Theodore Dreiser’s best-selling novel that deals with the sordid side of the American dream. How does a young man overcome his poverty and achieve financial success and social standing? Drawn from a true story, the protagonist fares badly — he causes the death of his pregnant girlfriend when she gets in the way of his success. Because the 1925 novel runs to nearly a thousand pages, the opera libretto is considerably pared down, as one would expect. Despite the able direction of Francesca Zambello who has selected the best possible cast, the music and the text fail to produce characters that are sympathetic or a message that informs today’s situation in the world. The story of the opera establishes the anti-hero Clyde Griffiths as a young boy (played by the boy soprano Graham Phillips) growing up in a family of street missionaries. Act I quickly moves to Clyde as a young man (baritone Nathan Gunn) working first in a seedy hotel and then progressing to management in his uncle Samuel’s (tenor Kim Begley) factory. There he is told by Samuel’s high-roller son, Gilbert (tenor William Burden), to keep his hands off the ladies. By the end of act I, Roberta (soprano Patricia Racette), one of the factory workers, is pregnant and demands that Clyde marry her while Clyde has already moved on to his cousin Bella’s friend Sondra Finchely (mezzo-soprano Susan Graham) who is a sophisticated society debutante. Neither the selected story details nor the music of Picker and Scheer’s collaboration create a sympathetic emotional base for Clyde. Unlike Dreiser’s novel, the shame that the boy Clyde feels when his mother (mezzo-soprano Dolora Zajick) has him sing in the streets is lost. What the Met audience hears is the un-nuanced angelic voice of Graham Phillips singing, “Tis so sweet to trust in Jesus.” Although the opening music is brooding, the tonal music with dissonant shading and the text do not suggest that the boy is uncomfortable with the ways and means of his family. In his first job as a bellhop, Clyde tries on a hotel guest’s cashmere coat and later abandon’s the girl he has been pursuing as soon as he convinces his uncle to hire him. Once on the job in his uncle’s factory, Clyde’s ambition grows as he watches his cousin Gilbert drive a shiny new car. Nathan Gunn as Clyde delivers a fetching song, saying: “My future is as bright as polished chrome.” Materialism is Clyde’s mantra. Act I offers a number of memorable arias and duets including Sondra’s declaration that New York has changed her. Susan Graham’s performance is both vocally energetic and entertaining. Clyde’s seduction of Roberta is portrayed with lyrically beautiful music. And the seduction scene plays against Sondra Finchely’s drawing room girl talk scene with Bella (soprano Jennifer Aylmer). This is the emotional high point of the opera both in text and music. Adrianne Lobel’s design presents a two-tiered stage as one might see a doll’s house. Thus while Clyde seduces Roberta on the ground floor, Sondra and Bella interact on a floor above. The audience sees and understands that the two pairs of players are in separate houses. Besides Lobel, director Francesca Zambello has chosen impressive supporting partners, including choreographer Doug Varone. 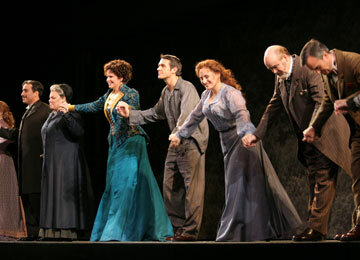 Varone’s choreography features William Burden as Gilbert dancing drunkenly at his sister Bella’s birthday party. The music is jazzy and the scene plays like a Broadway musical. Visually the most striking scene of the opera occurs in Act II Scene 3 with Clyde and Roberta in a canoe. The full-sized canoe is in a large window on the second level of the tiered set. When the anguished Clyde accidentally knocks Roberta out of the boat, another window opens on the lower level of the set and Roberta is seen flailing under water. This scene is prefaced by Clyde plotting Roberta’s death by becoming “someone else who will disappear with her tomorrow.” Did Clyde mean to kill her? It is not clear, but because he does nothing to rescue her, she drowns and she drowns with a great deal of melodramatic screaming. Because letters to him are found in her pockets, he is arrested, tried and sentenced to die in the electric chair. His mother tries to save him, but he eventually confesses to her that he did nothing to rescue Roberta. The last scene brings back a reprise of the song “Tis so sweet to trust in Jesus” and sees him walking hand in hand with his boyhood self as he approaches the electric chair. Except for an overly long full-cast church scene used to allow Roberta to confront Clyde while he has been enjoying the company of Sondra and her well-to-do community, Act II moves at a reasonably good pace. Although issues of materialism, morality, and faith are timeless, what Picker and Scheer’s audience will glean from their interpretation of this early 20th Century novel is questionable. Are women and the church the source of all problems that men experience? Does confessing and trusting in Jesus exonerate a man from his moral failings? Has Clyde been victimized by his quest for the American dream? Now it’s time to go back and read Dreiser’s novel and see the Academy Award-winning film by George Stevens A Place in the Sun.